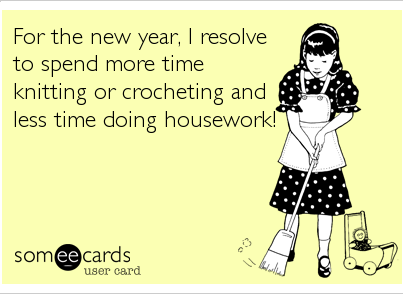 Life of a Knitphomaniac: Hello 2015! Was the new year good to you? So far it has been good to me! For the last few days of 2014 I was knitting away at the cowl for my sister. I had to finish by 12/31/14 for Loopy Academy.....and I did it! 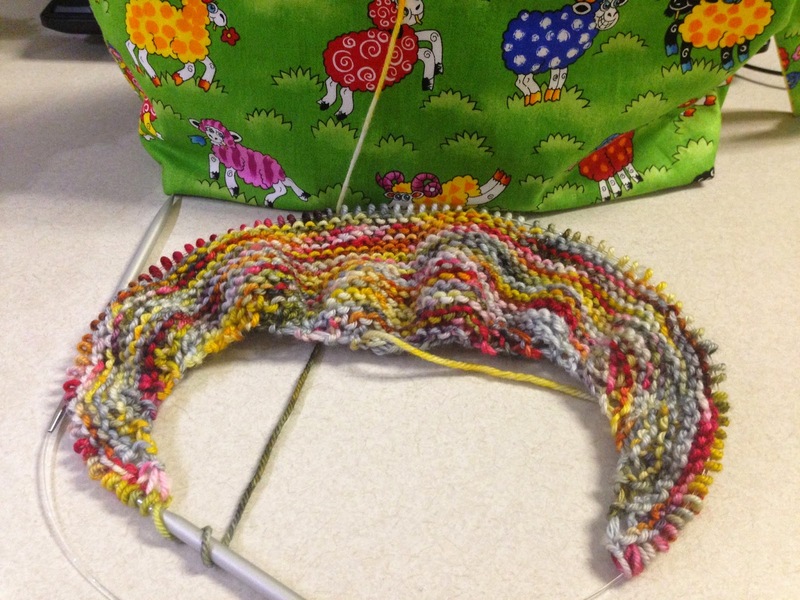 This was the picture uploaded for Loopy Academy....it still needed blocking! I will see my sister this Thursday, so I will give it to her then! I ordered some Miss Babs Yarn with her graditude sale she does every year. This is a skein of Yowza in the Volcanic Eruption Colorway......I really love it! Speaking of Yowza....remember the Skein of Joan of Arc that Darlene got me for Christmas? Well, we are doing a KAL in her Ravelry group for the Yowza Weigh It Shawl or the Yowza Weigh It Shawl 2! Both patterns are by Susan B Anderson. You should really come join us...You do not have to have Yowza....any yarn is fine! First, I weighed my skein and it is a VERY GENEROUS skein. It is supposed to be 8 ounces, but mine is 9.14...YOWZA! Then, I cast on with the girls at SNB on Saturday! It is SUPER easy....it has ONE row you repeat over and over and over again....then one other row...then knit....then bind off.....Come and join us here! I did get some other knitting done.....Jaime was hunting again this weekend....so I was at home all weekend to do nothing but knit! To explain to you why I knit what I did....there is a small story behind it.....There was a contest on FB to win a free yarn bowl......so I shared this picture and liked the page in hopes to win.....well, a friend of mine commented on the photo that she could make me a yarn bowl. I had no clue she did pottery. She said she does not have a wheel, but she has a kiln. So, I asked her how much a yarn bowl would cost.....she wanted to trade...she sent me a picture of a headband she wanted some more of. She said some 'fuzzy' and some solids in black, grey and red.....I sent her pictures of my 'fuzzy' yarn and she picked some.....I got one pattern from an LSSK friend and one pattern from Ravelry.....then I started knitting......and made nine....yes, nine.....headbands! I sent them out in the mail to her today. I know she will not get to my yarn bowl for a few weeks...but I am glad I got these out of the way....they were fun to make, but now I am tired of making them....ha, ha! The great news is that she did not need me to make any flowers for them, and she also said she has buttons, so there was no need for me to put buttons on them....double win! I also finished a pair of socks from July....yup, these were some Tour de Sock socks.....and I really wanted to finish them in 2014...but I was a few days late.....but they are DONE! My first big FO of 2015 (not counting the tiny headbands)! I have a couple other 'enhancements' but they are not stash enhancements....but I have to share with you anyway....in the past, I usually do not wear my hand knit socks to work for a silly, silly reason....when I get home from work, I take off my work shoes and go straight into flip flops....so, if my hand knit socks were not flip flop socks. Yes, I know that is silly! So, I told my boyfriend, Jaime, that I wanted some slippers and I sent him the link to the ones I wanted. Well, I got them Friday....and I LOVE THEM!!!!!! Thank you Jaime!!! Wearing them with my favorite Jammies! Okay.....now to take you back to a post a few weeks ago about some knit cable wax warmers....Apparently, great minds think alike.....My sister got my mom a wax warmer set (this was from both of us, but my sister does the shopping and I just giver her money....correction, my sister's husband does the shopping, and I give the money)....well I loved this set and so did my daughter. There was a pine garland and pomegranate champagne scent that were both heavenly......so I asked my BIL where he got them.....Lowes! Yup, Lowes.....so I found some online and ordered them. I gave my daughter both of the wax holders (because I have my cable ones) but, I did steal the 3 wax scents. I also have several scentsy waxes that she took from me.....I wish this pine garland and pomegranate champagne were sold by themselves! I hope everyone has a fabulous 2015! 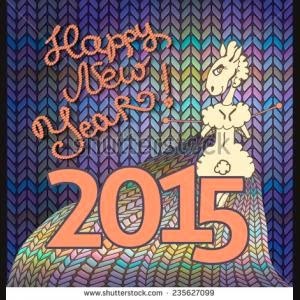 Happy Happy New Year and Happy Happy Happy Knitting! I have never heard of socks coming unknitted in the wash. I'll start checking mine a bit closer from now on. Love the candle warmer. I'm going to check our local store to see if they carry them. You're off to a great new year knitting! Great looking projects! !